Icons may also be cast in metal, carved in stone, embroidered on cloth, painted on wood, done in mosaic or fresco work, printed on paper or metal, etc. Comparable images from Western Christianity are generally not classified as "icons", although "iconic" may be used[ by whom?] to describe a static style of devotional image. Aside from the legend that Pilate had made an image of Christ, the 4th-century Eusebius of Caesarea, in his Church History, provides a more substantial reference to a "first" icon of Jesus. He relates that King Abgar of Edessa (died c. 50 CE) sent a letter to Jesus at Jerusalem, asking Jesus to come and heal him of an illness. In this version there is no image. A later account found in the Syriac Doctrine of Addai (ca. 400 ?) mentions a painted image of Jesus in the story; and even later, in the 6th-century account given by Evagrius Scholasticus, the painted image transforms into an image that miraculously appeared on a towel when Christ pressed the cloth to his wet face. Further legends relate that the cloth remained in Edessa until the 10th century, when it was taken to Constantinople. It went missing in 1204 when Crusaders sacked Constantinople, but by then numerous copies had firmly established its iconic type. 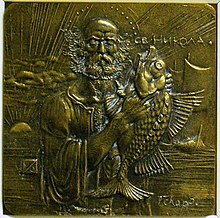 Elsewhere in his Church History, Eusebius reports seeing what he took to be portraits of Jesus, Peter and Paul, and also mentions a bronze statue at Banias / Paneas under Mount Hermon, of which he wrote, "They say that this statue is an image of Jesus" (H.E. 7:18); further, he relates that locals regarded the image as a memorial of the healing of the woman with an issue of blood by Jesus (Luke 8:43–48), because it depicted a standing man wearing a double cloak and with arm outstretched, and a woman kneeling before him with arms reaching out as if in supplication. John Francis Wilson  suggests the possibility that this refers to a pagan bronze statue whose true identity had been forgotten; some[ who?] have thought it to represent Aesculapius, the Greek god of healing, but the description of the standing figure and the woman kneeling in supplication precisely matches images found on coins depicting the bearded emperor Hadrian reaching out to a female figure—symbolizing a province—kneeling before him. After the emperor Constantine I extended official toleration of Christianity within the Roman Empire in 313, huge numbers of pagans became converts. This period of Christianization probably saw the use of Christian images became very widespread among the faithful, though with great differences from pagan habits. Robin Lane Fox states  "By the early fifth century, we know of the ownership of private icons of saints; by c. 480–500, we can be sure that the inside of a saint's shrine would be adorned with images and votive portraits, a practice which had probably begun earlier." 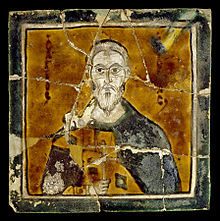 When Constantine himself (r. 306–337) apparently converted to Christianity, the majority of his subjects remained pagans. The Roman Imperial cult of the divinity of the emperor, expressed through the traditional burning of candles and the offering of incense to the emperor's image, was tolerated for a period because it would have been politically dangerous to attempt to suppress it. [ citation needed] Indeed, in the 5th century the courts of justice and municipal buildings of the empire still honoured the portrait of the reigning emperor in this way. 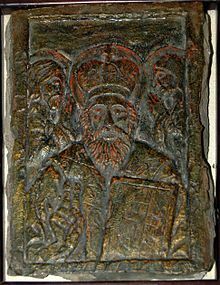 In 425 Philostorgius, an allegedly Arian Christian, charged the Orthodox Christians in Constantinople with idolatry because they still honored the image of the emperor Constantine the Great, the founder of the city, in this way. Dix notes that this occurred more than a century before we find the first reference to a similar honouring of the image of Christ or of His apostles or saints, but that it would seem a natural progression for the image of Christ, the King of Heaven and Earth, to be paid similar veneration as that given to the earthly Roman emperor. However, the Orthodox, Eastern Catholics, and other groups insist on explicitly distinguishing the veneration of icons from the worship of idols by pagans. See further below on this topic. Christ and Saint Menas, 6th-century Coptic icon from Egypt ( Musée du Louvre). 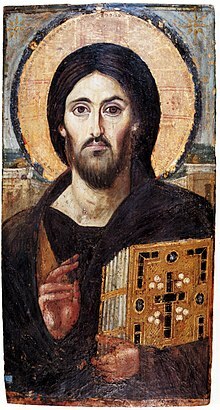 The oldest surviving icon of Christ Pantocrator, encaustic on panel, c. 6th century ( Saint Catherine's Monastery, Mount Sinai). 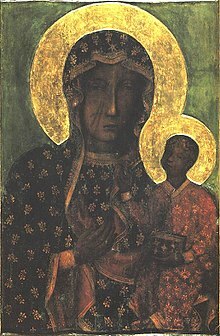 It is in a context attributed to the 5th century that the first mention of an image of Mary painted from life appears, though earlier paintings on catacomb walls bear resemblance to modern icons of Mary. 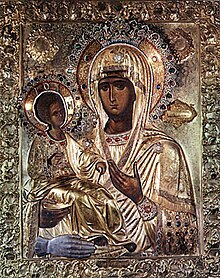 Theodorus Lector, in his 6th-century History of the Church 1:1  stated that Eudokia (wife of emperor Theodosius II, d. 460) sent an image of the " Mother of God" named Icon of the Hodegetria from Jerusalem to Pulcheria, daughter of Arcadius, the former emperor and father of Theodosius II. The image was specified to have been "painted by the Apostle Luke." There was a continuing opposition to images and their misuse within Christianity from very early times. "Whenever images threatened to gain undue influence within the church, theologians have sought to strip them of their power". Further, "there is no century between the fourth and the eighth in which there is not some evidence of opposition to images even within the Church". Nonetheless, popular favor for icons guaranteed their continued existence, while no systematic apologia for or against icons, or doctrinal authorization or condemnation of icons yet existed. 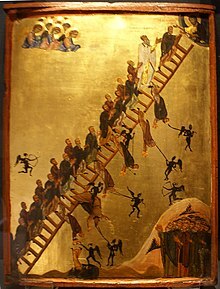 The tradition of acheiropoieta (ἀχειροποίητα, literally "not-made-by-hand") accrued to icons that are alleged to have come into existence miraculously, not by a human painter. Such images functioned as powerful relics as well as icons, and their images were naturally seen as especially authoritative as to the true appearance of the subject: naturally and especially because of the reluctance to accept mere human productions as embodying anything of the divine, a commonplace of Christian deprecation of man-made " idols". Like icons believed to be painted directly from the live subject, they therefore acted as important references for other images in the tradition. Beside the developed legend of the mandylion or Image of Edessa, was the tale of the Veil of Veronica, whose very name signifies "true icon" or "true image", the fear of a "false image" remaining strong. 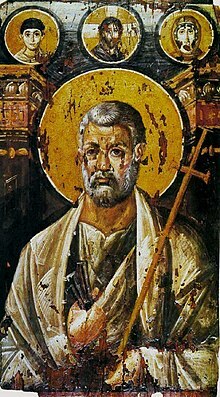 St Peter encaustic on panel, c. 6th century ( Saint Catherine's Monastery). 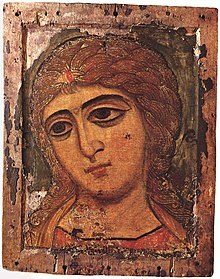 Although there are earlier records of their use, no panel icons earlier than the few from the 6th century preserved at the Greek Orthodox Saint Catherine's Monastery in Egypt survive,  as the other examples in Rome have all been drastically over-painted. The surviving evidence for the earliest depictions of Christ, Mary and saints therefore comes from wall-paintings, mosaics and some carvings. They are realistic in appearance, in contrast to the later stylization. They are broadly similar in style, though often much superior in quality, to the mummy portraits done in wax ( encaustic) and found at Fayyum in Egypt. As we may judge from such items, the first depictions of Jesus were generic rather than portrait images, generally representing him as a beardless young man. 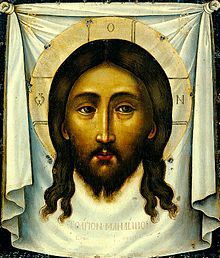 It was some time before the earliest examples of the long-haired, bearded face that was later to become standardized as the image of Jesus appeared. When they did begin to appear there was still variation. Augustine of Hippo (354–430)  said that no one knew the appearance of Jesus or that of Mary. However, Augustine was not a resident of the Holy Land and therefore was not familiar with the local populations and their oral traditions. Gradually, paintings of Jesus took on characteristics of portrait images. At this time the manner of depicting Jesus was not yet uniform, and there was some controversy over which of the two most common icons was to be favored. The first or "Semitic" form showed Jesus with short and "frizzy" hair; the second showed a bearded Jesus with hair parted in the middle, the manner in which the god Zeus was depicted. Theodorus Lector remarked  that of the two, the one with short and frizzy hair was "more authentic". To support his assertion, he relates a story (excerpted by John of Damascus) that a pagan commissioned to paint an image of Jesus used the "Zeus" form instead of the "Semitic" form, and that as punishment his hands withered. Though their development was gradual, we can date the full-blown appearance and general ecclesiastical (as opposed to simply popular or local) acceptance of Christian images as venerated and miracle-working objects to the 6th century, when, as Hans Belting writes,  "we first hear of the church's use of religious images." "As we reach the second half of the sixth century, we find that images are attracting direct veneration and some of them are credited with the performance of miracles"  Cyril Mango writes,  "In the post-Justinianic period the icon assumes an ever increasing role in popular devotion, and there is a proliferation of miracle stories connected with icons, some of them rather shocking to our eyes". 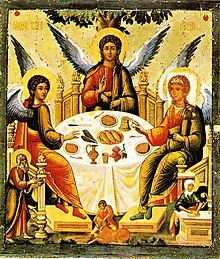 However, the earlier references by Eusebius and Irenaeus indicate veneration of images and reported miracles associated with them as early as the 2nd century. What might be shocking to our contemporary eyes may not have been viewed as such by the early Christians. Acts 5:15 reports that "people brought the sick into the streets and laid them on beds and mats so that at least Peter's shadow might fall on some of them as he passed by." Basil of Caesarea, in his writing On the Holy Spirit, says: "The honor paid to the image passes to the prototype". He also illustrates the concept by saying, "If I point to a statue of Caesar and ask you 'Who is that? ', your answer would properly be, 'It is Caesar.' When you say such you do not mean that the stone itself is Caesar, but rather, the name and honor you ascribe to the statue passes over to the original, the archetype, Caesar himself." So it is with an Icon. In the mid-17th century, changes in liturgy and practice instituted by Patriarch Nikon of Moscow resulted in a split in the Russian Orthodox Church. The traditionalists, the persecuted "Old Ritualists" or " Old Believers", continued the traditional stylization of icons, while the State Church modified its practice. 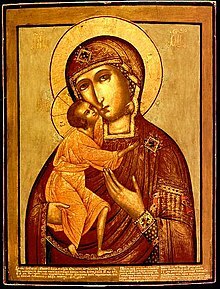 From that time icons began to be painted not only in the traditional stylized and nonrealistic mode, but also in a mixture of Russian stylization and Western European realism, and in a Western European manner very much like that of Catholic religious art of the time. 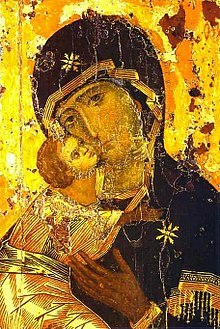 The Stroganov School and the icons from Nevyansk rank among the last important schools of Russian icon-painting. A modern metal icon of Saint Nicholas by the Bulgarian artist Georgi 'Chapa' Chapkanov. This depiction differs radically from traditional Orthodox iconography ( Gilbert House, Stanley, Falkland Islands). 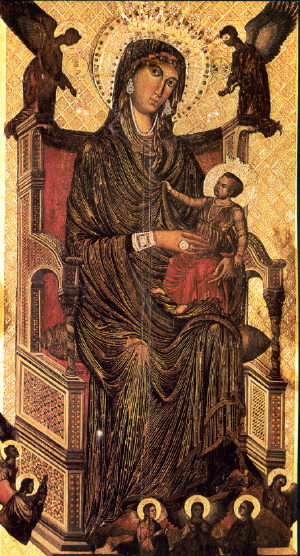 Although the word "icon" is not used in Western Christianity, there are religious works of art which were largely patterned on Byzantine works, and equally conventional in composition and depiction. 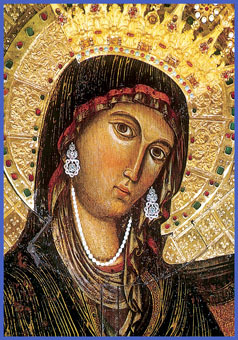 Until the 13th century, "icon"-like portraits followed East pattern—although very few survive from this early period. From the 13th century, the western tradition came slowly to allow the artist far more flexibility, and a more realist approach to the figures. 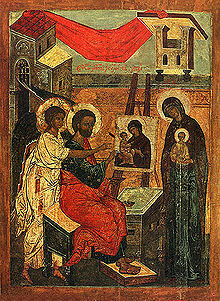 If only because there was a much smaller number of skilled artists, the quantity of works of art, in the sense of panel paintings, was much smaller in the West, and in most Western settings a single diptych as an altarpiece, or in a domestic room, probably stood in place of the larger collections typical of Orthodox " icon corners".